Macenstein publishes a screenshot from the latest build of Mac OS X Leopard 10.5.2 that reveals that Apple has included a List-View into Stacks. 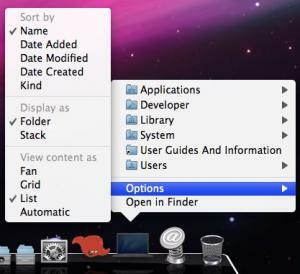 Stacks is a file organization feature introduced in Mac OS X 10.5 (Leopard). There's just not enough room in a single Dock tile for a stack of icons to convey any meaningful information. Only the top one, two, maybe three items have any visual impact. And those few items may be misleading (e.g., the home folder appearing to be the Desktop folder) or completely generic (e.g., the Pictures and Movies folders showing up as plain folder icons.) Seriously, Apple, this is a bad idea. Mac OS X 10.5.2 was seeded to developers on Tuesday night. It is not yet available to the general public.